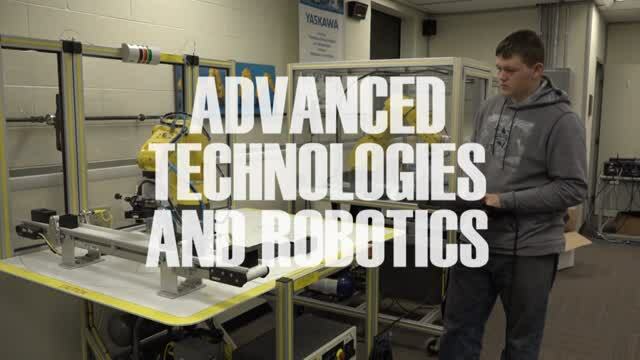 The Advanced Manufacturing and Robotics Program prepares students for entry-level employment in high-demand industry occupations. Numerous multi-craft technical skills, including Industrial Electrical and Mechanical, Programmable Logic Controls, Fluid Power, Robotic Programming and CNC Programming disciplines are taught using a largely hands-on approach to skill development. The RAMTEC Lab at the Warren County Career Center is one of just 10 advanced manufacturing training centers of their type in Ohio. This training center for area manufacturers and employees ensures that Ohio’s workforce remains on the cutting edge. Students train on Fanuc, Motoman, and other industry standard equipment. Students will learn a variety of skills needed in industrial troubleshooting and maintenance of complex automation equipment and components used in energy processing, consumer product production, and the construction of high-tech machinery and durable goods. Students may participate in internships during their program, and may be eligible for early job placement the second half of their senior year. Advanced Manufacturing & Robotics students participate in SkillsUSA, a partnership of students, teachers and industry, working together to ensure America has a skilled workforce. All students also have the opportunity to participate in the Tech Prep Showcase through the Miami Valley Tech Prep Consortium. For more information, contact Chuck Higgins, Instructor, at Chuck.Higgins@mywccc.org, or call 513-932-5677 ext. 5304.